In partnership with the Friends of the Gloucester County Library System, GCLS is excited to open this new space where community members of all ages can come together to imagine, tinker, and create! What can be created in the CreativityStudio@GCLS? 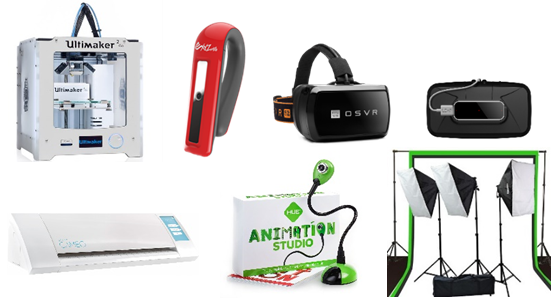 Download our CreativityStudio Equipment List for more information about each of the above accessories. Does it cost anything to use the CreativityStudio@GCLS? $0.10 per linear inch (x 12" or 15" wide) - rounded up to the nearest inch. Is there programming at the CreativityStudio? Check the upcoming events list on the right side of this page, or you can view all current and upcoming events on the calendar page. Who helped get the CreativityStudio funded? GCLS and the Friends of the Gloucester County Library System would like to thank everyone who generously donated to the crowdfunding campaign, to help open the CreativityStudio@GCLS. An electronic readers' advisory resource which assists fiction and nonfiction readers in finding new authors and titles.